Li Hua makes a living playing computer games. Working from a cramped office in the heart of Changsha, China, he slays dragons and loots virtual gold in 10-hour shifts. Next to him, rows of other young workers do the same. 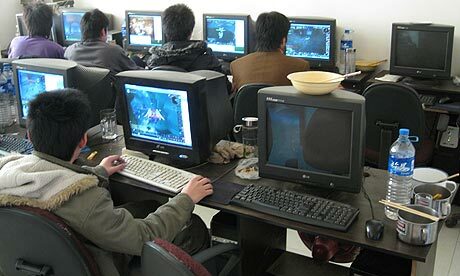 "It is just like working in a factory, the only difference is that this is the virtual world," says Li. "The working conditions are hard. We don't get weekends off and I only have one day free a month. But compared to other jobs it is good. I have no other skills and I enjoy playing sometimes." Li is just one of more than 100 workers employed by Wow7gold, an internet-based company that makes more than £1m a year selling in-game advantages to World of Warcraft (WoW) players. Customers may ask for their avatar's skill level to be increased ("power levelling"), or for a virtual magic sword or precious ore to be obtained. As one player put it: "Where there's a demand, China will supply it." From the Guardian. Full article here.